Breville Hemisphere Control Blender - Eat. Move. Hack. Using a blender should be a hassle-free experience from start to finish, shouldn’t it? When you’re not willing to settle for mixes being only partially blended and a blender that never seems to get clean enough, that’s when you turn to a premium model like the Breville Hemisphere Control Blender. At around $200, this is an investment for your kitchen. It’s the kind of small appliance you’d buy when you plan to use it often, keep it for years, and want it to be a show piece on your countertop. Made from bpa-free, lightweight, superior clarity and shatter resistant eastman tritan copolyester.The blade design and high torque motor delivers quiet and efficient blending performance, while the contoured bowl design minimizes food traps and makes for easy cleaning. There are a lot of great-sounding features that attract consumers to purchase this Breville blender. In addition to its sleek, stylish design that seems to be made for modern decor, there’s the unique bowl and blade system. It’s also supposed to serve the need of those who expect a lot of power. Whether you’re a pro chef who likes to practice your skills at home or a buff bodybuilder looking to make that gritty protein shake into something palatable, it could be that the Breville Hemisphere Control Blender is exactly the appliance you need. It’s designed to run quiet, be easy-to-clean, and blend all of the ingredients without you having to stop and stir. But can this high-rated blender satisfy your standards? We’ll soon find out. The permanent hemisphere bowl and blade system is perhaps the most unique thing about this item. This system is designed to solve a specific problem that users of many other blenders encounter. Certain ingredients just never seem to get down to the blades to be blended because they’re just too light. Well, no more of that when you have the Breville. It’s specialized bowl and blade system are made to draw down even the most lightweight foods where they can become part of your latest blended creation. The central blades sweep wide, hugging the bottom of the bowl. Ingredients have nowhere to hide underneath the blade system and neither will they be left floating on top. It saves users from having to pause the cycle and scrape the sides of the blender bowl. Some people swear they need a blender with a lot of speed options and some manufacturers are more than happy to satisfy the request. Well, the Breville Hemisphere Control Blender comes with just five speeds and pulse. That’s not necessarily a drawback, as these five maintain a consistent rpm speed, giving users consistent results every time. This blender features a very remarkable bowl that’s designed to enhance the overall look of the blender, be user-friendly, and enhance performance overall. Its rounded handle makes for a comfortable grip. The flat base makes it easy to sit on the counter without worry of it tipping over. The ergonomic spout allows for mess-free serving. It’s made of lightweight bpa-free copolyester and is completely shatterproof. Plus, with its generously large 48 oz. or six cup capacity, making enough may hardly ever be an issue. This blender has a heavy duty 1.0 horsepower motor that runs at 750 watts. It’s high torque yet runs smoothly and quietly, giving the power needed to power through your most challenging ingredients and transform them into your latest concoction. Now you don’t have to watch the clock or set a separate timer to know how long your blending has been going on. 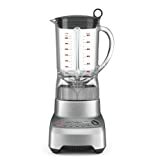 This blender comes with an easy-to-read LCD timer that works in sync with its settings, counting up on all the speed settings but counting down on all the pre-programmed settings. It’s just another way users of the Breville Hemisphere Control Blender get to be in complete control. Even those who truly know their blenders are impressed with this one. They find that it lacks many if not all of the issues most other blenders have, such as being too noisy or not blending all of the ingredients. Instead, it gives you a superior blending experience. The lid stays secure until you take it off. There’s no need to stop it midway through the process just to stir around the edges. This blender is a breeze to clean thoroughly, leaving no trace of your last creation. What a lot of users like about it is how notably quiet it is. It means no longer having to wait until the baby wakes up. All the buttons are beautifully illuminated and that makes them easier to read. Perhaps best of all, it works wonderfully well on all types of foods, including nuts and seeds, turning them all into a fine paste if you so choose. It does a great job of crushing ice. Indeed, this is truly a great blender, but there are a few complaints you should know about. For starters, though even with heavy use it outlasts most blenders, there are reports of it simply burning out after two years. Also, the blades are very sharp and users have to take care not to cut themselves. A few people have had issues with the plastic stopper that’s in the lid, claiming that it comes out easily though the lid stays in place. But perhaps the worse is that this blender can overheat on occasion, depending on the job. This is an excellent blender for those who want quality performance and are willing to pay the price. The features of this Breville blender more than justify the higher cost. It’s not the absolute best on the market, but it does a great job of ensuring all your ingredients get thoroughly incorporated into the mix. The fact that it’s so quiet is exciting, as it grants users the freedom to use this appliance without disrupting the entire house. And let’s face it, this blender looks cool, making it the perfect design pick for those whose kitchens are decked out in modern decor. If you want a better blender than the Breville Hemisphere Control Blender, there’s a good chance you’ll end up paying a whole lot more. There’s a great chance you’ll stay pleased with your purchase if you choose this as your new blender.